Ebony Office Interiors is looking forward to an exciting year. 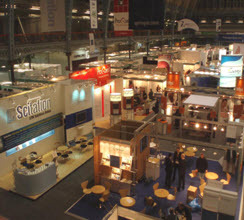 In over 30 years of business we have attended supplier fairs consistently. We believe they are a wonderful opportunity to put a face to a name and develop a rapport. It's not only an opportunity for sharing our business, but it is also an opportunity for developing new relationships and reconnecting with the ones that exist. Going to supplier fairs can be a waste of time unless you go with the intention of improving your knowledge, building relationships, and/or gaining resources to make future business decisions. We look forward to meeting you at the, University of Washington, 7th Annual Business Diversity Supplier Fair February 20, 2013. It's from 11:00am-2:00pm in the Hub North Ballroom.